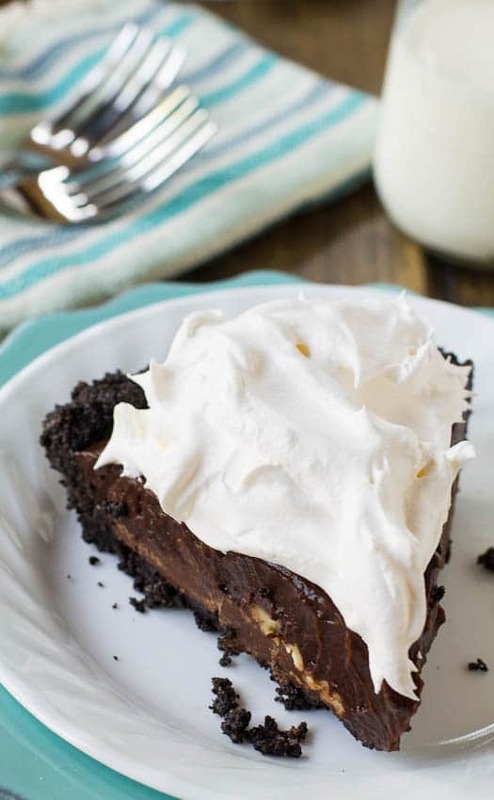 Mississippi Mud Pie with an oreo crust, two layers of chocolate, and a cool and creamy whipped topping. 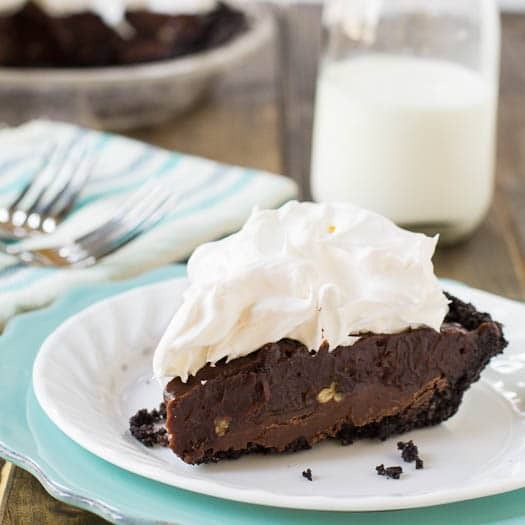 This no-bake icebox pie is impossible to resist. Did you make mud pies as a child? As in actual mud. I loved to. Layer after layer of dirt, mud, and sand, varying in consistency. At least one layer had to be really gloppy, runny mud. After the layering came the decorating. Sticks poking out on top, flowers and berries for color. Maybe a few acorns. With all the cell phones, video games, and iPads, I wonder if kids ever make mud pies anymore. Now that I’m older, I’ve traded dirt for chocolate to make my mud pies. 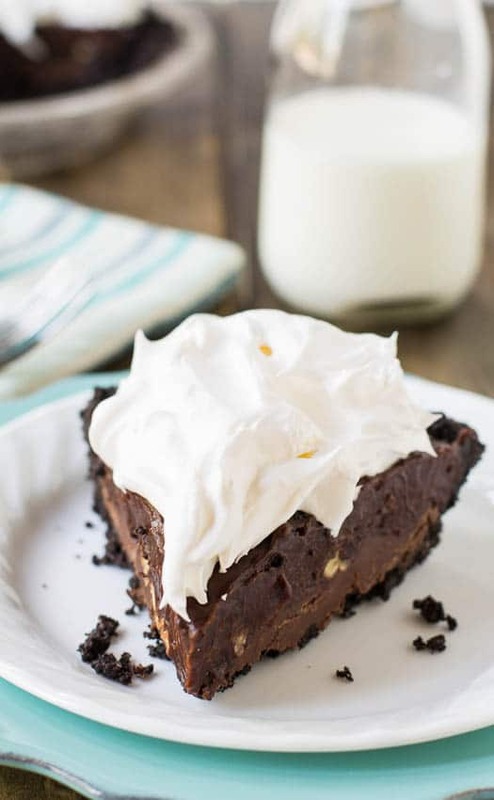 Mississippi Mud Pie is layer after layer of chocolate goodness. It all starts with an easy no-bake oreo crust followed by a fudgy and rich layer made from melted chocolate and sweetened condensed milk. Then comes a sprinkling of toasted pecans and a creamy, thick layer of chocolate pudding. To finish it all off, a nice coating of whipped topping. Super easy and super delicious. 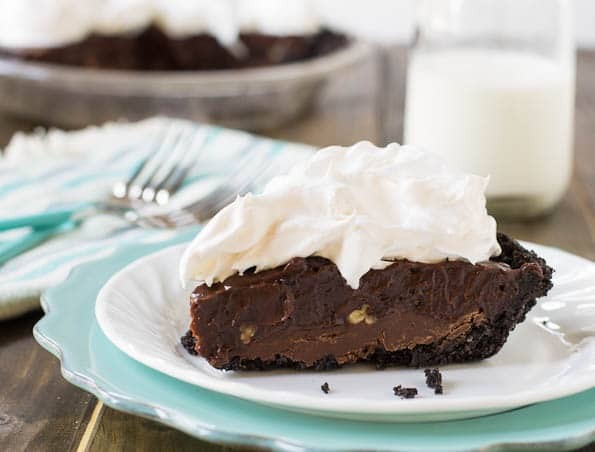 This pie is pure chocolate heaven. Don’t expect any leftovers. Because it is no-bake and it’s served cold, Mud Pies are perfect desserts for scorching hot days. We have months of hot weather coming our way, and hopefully months of Mud Pies too. 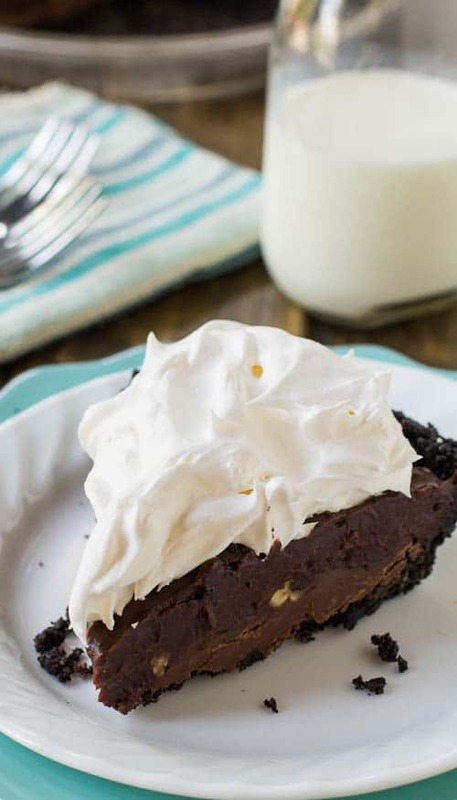 A rich and creamy no-bake chocolate pie covered with a layer of whipped topping. Place oreos in a food processor and process until finely ground. Place in a medium bowl and mix together with melted butter. Spoon into a 9-inch pie plate. Use your hands or the back of a wooden spoon to spread evenly. Press down firmly on crust. This will help it hold together. Refrigerate for at least 1 hour. In a small heavy-bottomed saucepan, melt chocolate. Remove from heat and stir in condensed milk. Pour on top of pie crust. Sprinkle pecans on top. In a medium bowl, whisk together pudding mix and milk for 1 minute. Fold 1/2 cup whipped topping into pudding mixture. Pour on top of pecans. Top with remaining whipped topping. Refrigerate until set. This entry was posted in Pies and Tarts and tagged chocolate, oreo, pie, pudding. Bookmark the permalink. Do you put the whole Oreo cookie in the food processor or just the cookies & remove the white creme between the cookies? 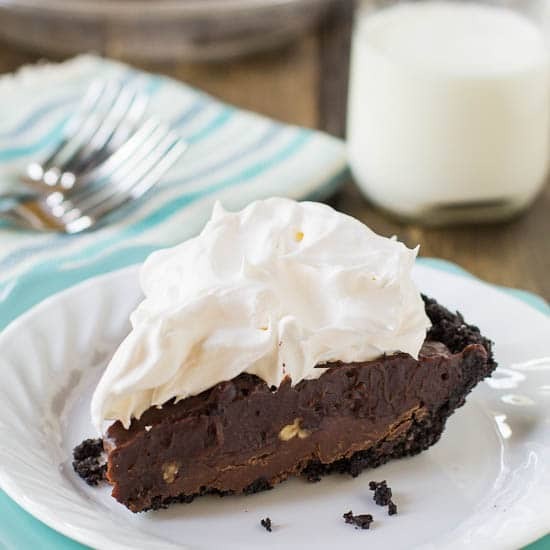 This is the best recipe for Mississippi Mud Pie! Other recipes were runny. This sets up fast and well! Is a hit with my husband. Instead of whipped cream, add 4 oz of cream cheese. 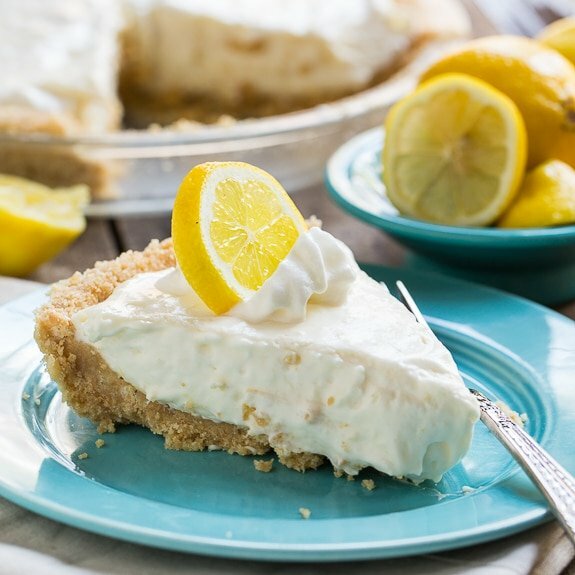 Really firms up the pie and cuts the super sweet taste while making it creamy! Oh wow! That sounds fantastic Frank! Your pie looks divine!! I love anything that is rich and chocolate, but this also looks like a good dessert for a summer night with all the whipped cream! Thanks for sharing! Absolutely the BEST mudpie I have ever tasted! I had to substitute the cooked version of pudding but I think that just made it thicker and richer on top. It’s to die for and I will be taking the recipe with me on an upcoming RV trip. I’m quite sure that one glimpse of this lovely dessert and my RV neighbors will bring out their forks! This looks wonderful. Might have to make this for tomorrows’ dessert!! This looks absolutely divine…perfect…tempting..amazing and any other descriptive word I could think of. ;-} Thanks so much for sharing at Weekend Potluck. Please come back soon. 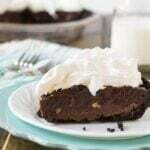 I’ve never had Mississippi Mud Pie and I think that has to change soon. Dried mud is a pretty weird feeling! And I must say I’ve never had any temptation to have one of those spa mud baths. Hope you have a wonderful weekend too Marcie! I never made mud pies (ew dirt under my nails). But this is a mud pie I would absolutely love. Looks super delicious! Eeeep! I must have a piece of this pie! It looks amazing!!! Oh goodness, this mud pie looks fabulous! I don’t think I ever had mud pie to be honest but now it’s all I can think about! So glad you traded the real mud for chocolate heehee. 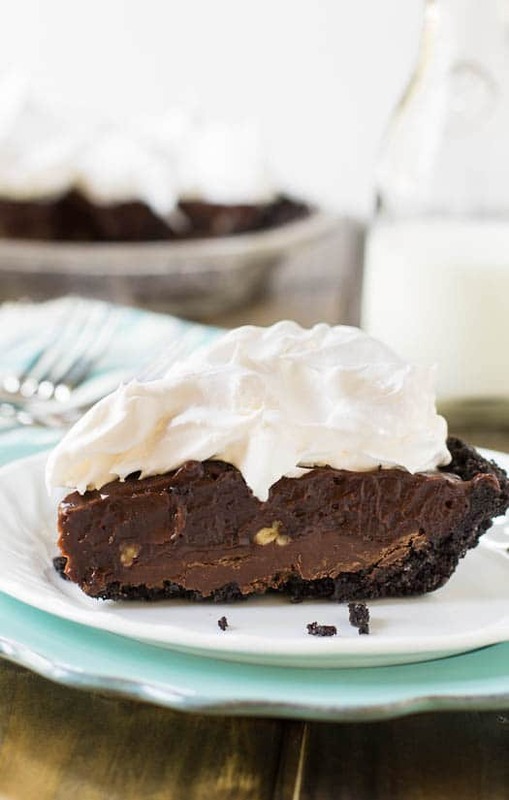 🙂 This pie looks decadent and delicious and right up my alley! Oh man this looks good! Gosh this pie will be in my dreams tonight. Amazing!! I will trade chocolate for dirt ANYDAY!!! I did make mud pies as a girl, but I must confess I’m far more fond of the dessert version! Thank you for sharing such a delicious rendition. I hope you have a wonderful week!